For the record, I have no affiliation to Le Boat or France or canals or whatever. I’m not being paid to write this. I doubt that anyone influential in any of those companies or fields will even ever read it. It pains me that I feel that I have to tell you this sort of thing, but there are so many paid-for posts out there that it’s actually getting hard to find an honest positive review. This is one of those though. Promise. 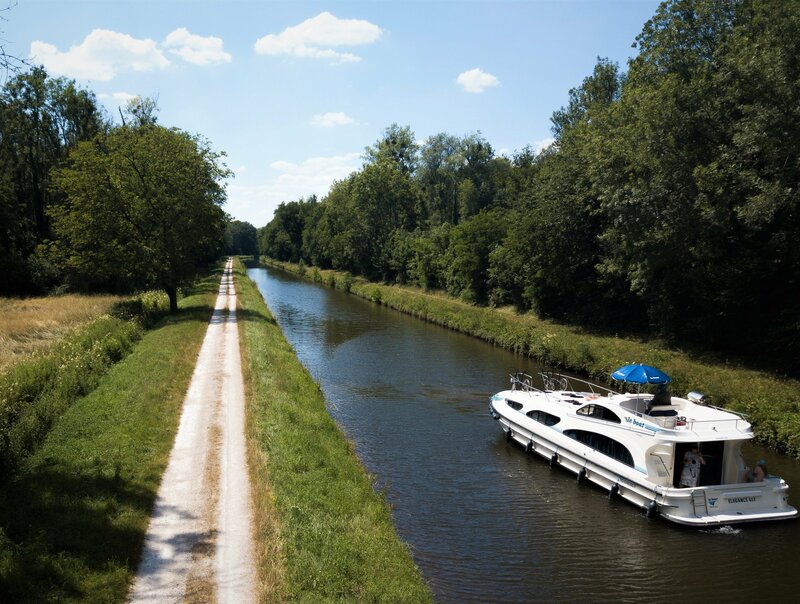 We’ve just finished the Le Boat 7 day trip from Tannay to Migennes along the Canal du Nivernais and so I thought I’d put finger to keyboard and give future visitors some advice on what to do, what not to do and what to expect generally from your boat and your cruise. Just a few things that if we had known before we started would have made our trip that bit easier. Not that it hasn’t been great anyway: none of these are dealbreakers. I thoroughly recommend this as an absolutely fantastic experience. Getting to Tannay isn’t the easiest. It’s not a big place. There are trains, but they are few and far between (two a day when we were there and at unhelful times too). Rather get a train to Auxerre or Clamecy and grab a taxi from there. The convenience outweighs the extra cost. We set off from the Tannay base at about 4pm on Wednesday. Our itinerary was completely up to us, just as yours is completely up to you, but this worked perfectly for us and so I’m sharing it here. Feel free to save or share this page, and ask any questions and share your thoughts in the comments below. Wednesday evening: Villiers-sur-Yonne (PK 105) – free power and water. Trees, countryside, tiny village. Thursday lunchtime: Clamecy (PK 113.5) – a quick stop to look at the church and get some supplies at Carrefour City (Rue Marie Davy). Thursday evening: Pousseau (PK 121) – simple anchor point with no facilities, but quiet and just 900m from the boulangerie in Surgy (just off traffic circle at Rue du Herisson). Friday lunchtime: Chatel-Censoir (PK 132.5) – mini marina – EUR 6 for water and electricity. Connect up and a man with a book will come and see you. Friday evening: Mailly-le-Chateau (PK 141.7). A basin to ourselves on the edge of a forest. A walk up to the town on top of the cliffs to get bread (Boulangerie, Rue du Jeu de Paume) will give you a superb view over the local countryside in the morning. Saturday lunchtime: We did the Vermenton branch and ate at the very nice Hostellerie de La Fontaine restaurant in Accolay (PK 3.0). Saturday evening: Cravant (PK 155.9). EUR 8 for unlimited water and electricity. The people at the tourist office right on the dock will help you out. Pretty little town, great boulangerie and grocer on Rue de la Poterrne. Sunday lunchtime: We stopped off for a couple of hours at the Caves in Bailly (PK 162.4). Do the tasting, but save your time and money and avoid the tour. Unless it’s really your sort of thing. Sunday evening: Nice spot on a pontoon near the lock at Toussac, Champs-sur-Yonne (PK 166.2), but tokens needed for services and nowhere open to buy them. Monday lunchtime/evening: Auxerre (PK 0.5) – Remarkable churches, amazing city, great waterfront with bars and restaurants (we enjoyed the burgers, beers and hospitality at the Restaurant Le Saint Nicolas). Huge supermarket on east side of footbridge (Avenue Jean Jaures). Water and electricity tokens available from tourist office, east bank, near footbridge). Tuesday evening: Migennes at junction of Canal de Bourgogne (PK 22.7) ahead of the boat return at 9am on Wednesday. Supermarket 150m, Boulangerie 200m, Station 350m (trains to Paris every hour). Well, the boats are really well-appointed. We didn’t need anything. We bought the grocery pack from Le Boat, so there were the basics waiting for us when we arrived on board. This was a good thing. If you don’t choose this option, you will need to bring some supplies along: water, wine, beers, bread, snacks or whatever to get you through the first 24 hours. That said, you will need to stock up while you’re on the canal and you should do so whenever you get the opportunity. Part of the charm of rural France is the laid back vibe, but it can be frustrating when places aren’t open and you have an urgent need for a pain au chocolat. We hired bikes, which you take with you on your boat. The towpaths are amazing for cycling along and it’s great to nip into nearby villages for croissants in the mornings. Take a flag. Tie it on your boat. We saw visitors from the US, New Zealand, Holland, Russia, Canada, Australia, Germany, South Africa and more. Don’t expect to rush. You can’t get anywhere quickly, so plan ahead and chill out. Respect the lockkeepers. They are all so friendly and helpful, but be aware that they are (rightfully) strict about opening and closing times and their lunch hours. Many speak some English. Not all of them though! Don’t worry about driving your boat: the demonstration when you arrive is very informative, and it’s really not that difficult anyway. Download MAPS.ME on your phone before you go. It’s like an offline Google Maps and can be super helpful when there isn’t any cell signal. Note: I’ll add some photos once I’ve had chance to edit them. And if anything else comes to mind, I’ll add that too. I’m going to stick this on TripAdvisor as well, because I’d love to have had this sort of info before we went away!